SMAD3 antibody LS-C18974 is an unconjugated rabbit polyclonal antibody to SMAD3 from human, mouse, rat and other species. Validated for ELISA, IHC and WB. 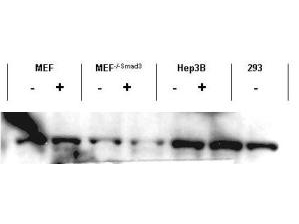 SMAD3 antibody was raised against synthetic peptide from human Smad3. Amino acids 417-425 of human SMAD3 protein. This affinity purified antibody has been tested for use in ELISA, immunohistochemistry and by western blot. Specific conditions for reactivity should be optimized by the end user. Expect a band approximately 48 kD in size corresponding to Smad3 protein by western blotting in the appropriate stimulated tissue or cell lysate or extract. This reagent reacts equally to phosphorylated and nonphosphorylated Smad3 by ELISA and western blotting. Store vial at -20°C prior to opening. Dilute only prior to immediate use. 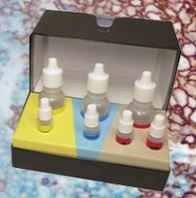 For extended storage aliquot contents and freeze at -20°C or below. Avoid freeze-thaw cycles. Anti-Smad3 Antibody - Immunohistochemistry. Affinity Purified anti-Smad3 antibody shows strong cytoplasmic and membranous staining of tumor cells in cancerous human liver tissue. Tissue was formalin-fixed and paraffin embedded. Brown color indicates presence of protein, blue color shows cell nuclei. Personal Communication, Kenneth Western, www. proteinatlas. org, Uppsala, Sweden. Anti-Smad3 Antibody - Western Blot. Western blot of affinity purified anti-Smad3 antibody shows detection of endogenous Smad3 in both unstimulated and stimulated cell lysates. Lysates were prepared from control cells (- lanes), or cells stimulated with 2 ng/ml TGF-beta lanes for 1 hour. This reagent recognizes both non-phosphorylated and phosphorylated Smad3 protein. Personal Communication. Ying Zhang, NIH, CCR, Bethesda, MD.